Stipple Calypso Kaleidacolor (or any rainbow-colored dye ink) on light colored card stock. Using one of the darker colors of ink, over-stamp with butterflies. 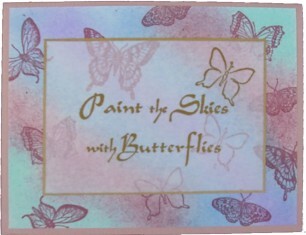 Stamp “Paint the Skies” and small butterfly with gold pigment ink on vellum. Emboss with gold powder. Edge vellum with gold pen. Attach vellum to stippled background with double stick tape. Note: Instead of embossing, try using Brilliance TM gold to stamp words.